Saginaw, Mich. — Scientists studying walleyes in Saginaw Bay have long known that they migrate into Lake Huron during the summer months. But the results of new telemetry research using radio-tagged fish shows as many as 2 million walleyes – far more than expected – leave for open waters as early as June. Fielder and other scientists do not know why they leave. It may be for cooler waters or for food. The radio-tagging study is providing information about where they go. Strategically placed acoustic sensors on the bottom of Lake Huron are helping researchers track the radio-implanted fish, according to Fielder. The data collected lets them know whether Saginaw Bay walleyes swim south to the St. Clair River or north to Drummond Island. The preliminary 2011 information is the first take from the three-year study funded by the Great Lakes Restoration Initiative. To date, $5 million has been spent to set up a network of hydro-acoustic sensors. The 350 sensors installed so far are used for a variety of research projects like tracking walleye, sea lampreys, lake trout, Great Lakes sturgeon, and Asian carp, according to Marc Gaden, communications coordinator with the Great Lakes Fishery Commission. The walleye study relies on approximately 160 sensors located on the bottom of Lake Huron, and bullet-size transmitters that have been surgically implanted in just over 400 walleye. Half of those fish come from the Tittabawassee River spawning run. The other half comes from the Maumee River on Lake Erie. That’s what scientists are trying to discover, according to Fielder. Chris Vandergoot, of the Ohio DNR, could not be reached for this story, but Fielder said his Ohio counterpart is using the technology to determine whether Lake Erie walleyes are migrating into Lake Huron. Lake Erie has been home to an estimated 70 million walleye in past years, according to Fielder. Jaw-tagging studies showed 1.5 percent of that population migrated into Lake Huron. Knowing that, or how many may end up in commercial fishing nets down by Sarnia, helps Michigan fisheries officials determine appropriate management decisions, Fielder said. “If we can get a network of these sensors established in the Great Lakes basin, any scientist could come to us and put a proposal forward to take advantage of the array. This is something that is widely used on the east coast and west coast of North America now,” Gaden said. 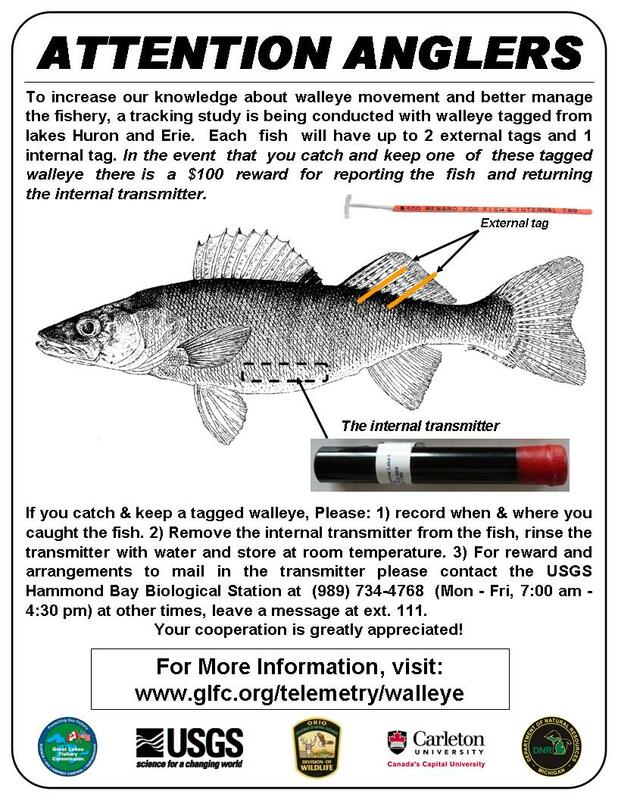 Anglers are being encouraged to help with the walleye project by returning any fish found with a transmitter and tag, which has numbers to contact. The reward is $100 for each. 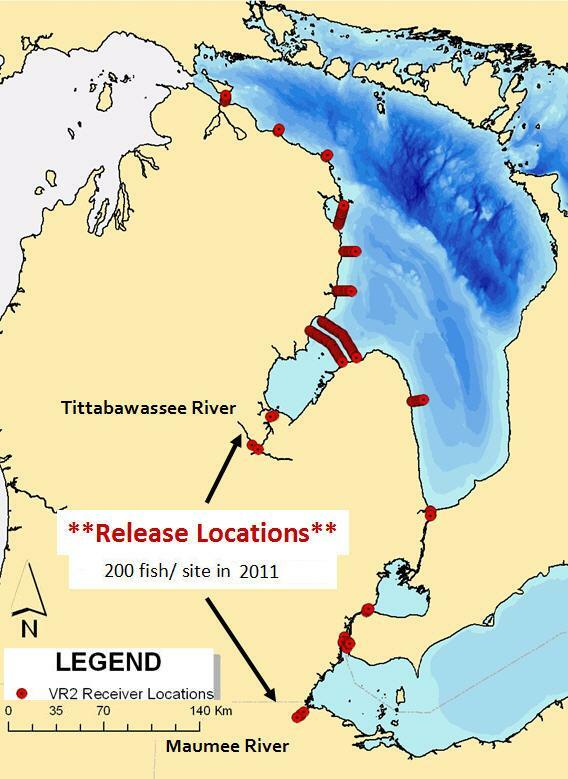 Study details and maps showing walleye movement on Lake Huron can be found at www.glfc.org/telemetry/walleye.php. This entry was posted in Uncategorized and tagged DNR, Fishing, Great Lakes Fishery Commission, Great Lakes Restoration Initiative, Lake Erie, Lake Huron, Telemetry, Walleye. Bookmark the permalink.